Softcover, 2014-2015 Edition, 326 pp. 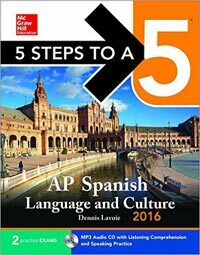 This guide is an easy-to-follow five-step plan to excel on the AP Exam. Students will learn to develop a study plan, develop strategies, review their knowledge, sharpen their test-taking skills and strategies, and create the confidence to ace the AP exam. Some of the topics included are: listening and reading comprehension, formal and informal writing, formal and informal conversation and full-length practice exams modeled on the real test.